Cream the shortening. Add the sugar gradually and keep stirring until fluffy. Beat in the eggs. Sift the dry ingredients together in a separate bowl and then stir a little of the dry mix into the wet mix, then a little of the cup of buttermilk, going back and forth between the two and mixing until both are used up. Finally, blend in all four flavorings. Pour into two well-greased and floured 9-inch pans. Bake at 350º F for 30-35 minutes. Source: M.G. 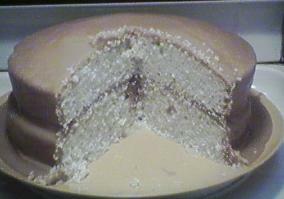 Nussbaum of Vicksburg, Mississippi; listed in Southern Living's The Desserts Cookbook.